Japanese woodblock prints were commercial productions made for popular consumption. They were made by artists, block cutters and printers working independently to the instructions of specialist publishers. Fan prints like this were mounted on rigid bamboo frames and sold in large numbers during Japan's hot and humid summer. This print depicts a key scene in the life of the legendary warrior monk Benkei, loyal henchman to Minamoto no Yoshitsune (1159-1189). 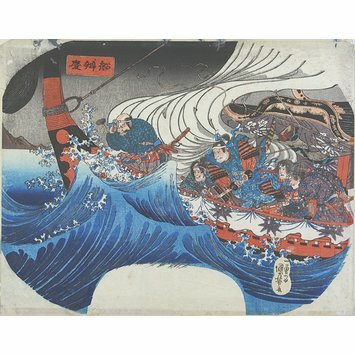 Fleeing to exile through the Shimonoseki straits, site of Yoshitsune's naval victory over the Taira clan at the battle of Dan-no-ura, Benkei's boat is caught in a storm brought about by the vengeful drowned Taira warriors. Benkei takes out his priest's rosary, with which he is able to calm the storm.